This silky artisan dark chocolate proves the motto that everything is better with butter. Heritage Swiss cows contribute their grass-fed cream to be churned, browned and stirred into the malty depths of our Ecuadorian cacao. Our master chocolatiers complete the taste spectrum with a touch of Fleur de Sel de Gu_rande for a salty sweet, luxuriously smooth bite. 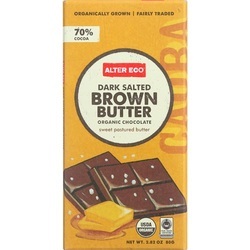 The deep, intensity of Dark Salted Brown Butter reflects the rainforest from which it hails. Fortaleza sits at the edge of the Ecuadorian coast, where the worldÍs richest soil and the shade of the forest canopy create an ideal environment for native cacao.